Tickets can be purchased at the Little Caesars Arena XFINITY box office and and Ticketmaster.com. For complete details and ticket availability, please see whydontwemusic.com. There is a six-ticket limit. Atlantic recording group Why Don’t We have announced details for their most extensive North American headline tour to date, including a stop at the Fox Theatre on Thursday, April 11, 2019 at 7 p.m.
Set for spring 2019, the cross-country trek begins March 20th at Comerica Theatre in Phoenix, AZ and travels through April. Highlights include stops at the Microsoft Theater in Los Angeles (March 22) and the famed Radio City Music Hall in New York City (April 5). 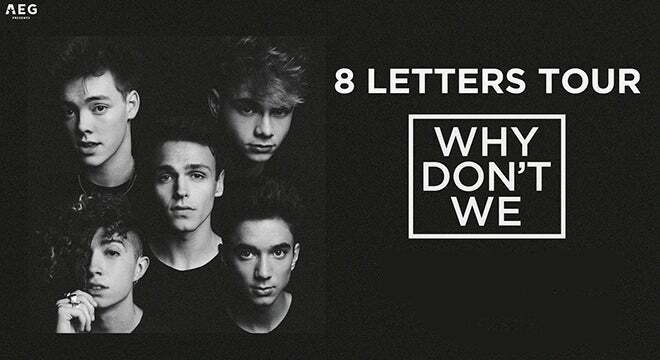 The North American spring headline tour supports Why Don’t We’s just released debut full length album, 8 LETTERS. Upon its arrival August 31, the album immediately shot to #1 on iTunes’ Overall Albums chart ahead of artists like Eminem, Ariana Grande, and Drake among others. A worldwide phenomenon, the album also topped charts in over 20 more territories around the globe. 8 LETTERS is available now at all music retailers and streaming services. Download/stream HERE. On Labor Day (Sept. 4), thousands of Why Don’t We fans packed New York City’s Rockefeller Plaza and the surrounding streets to watch the group’s special Labor Day concert for NBC’s TODAY, drawing the show’s biggest crowd of the summer. The performance kicked off a series of high profile TV appearances celebrating the release of 8 LETTERS. Next up, the band will perform on the nationally syndicated Live with Kelly and Ryan on Thursday, September 6. The media blitz continues the following week with appearances on MTV’s TRL on Monday, September 10 and CBS’ The Late Late Show with James Corden on Tuesday, September 11 (check local listings). The band is currently in the midst of a massive globetrotting, world tour, which has recently taken their exhilarating live show overseas throughout Asia - including stops in Thailand, Singapore, South Korea, Japan, China, Taiwan, and the Philippines – and Australia before returning stateside. October will see Why Don’t We crossing the Atlantic for their biggest European tour thus far, with shows scheduled in Spain, France, Ireland, the Netherlands, Germany and the United Kingdom, culminating in an October 25th finale at London’s famed Eventim Apollo Hammersmith. This fall, Why Don’t We is also set to release their official autobiography, In The Limelight. Published by Harper Collins, the book features never-before-seen photos and behind-the-scenes info about the young group’s incredible journey. In The Limelight is set for release on October 30th. More information HERE. Amassing more than 200 million global audio streams, three million Instagram followers, and total You Tube views exceeding 250 million with over two million subscribers in under two years, Why Don’t We has become one of pop music’s biggest breakout stories. Taking an innovative and unconventional approach towards releasing new music and actively engaging their rapidly growing fanbase, the prolific young group – the quintet ranges in age from 17-20 years old – put out four EPs in under 12 months. The group closed 2017 on a high note, performing on the entire iHeartRadio Jingle Ball Tour, including the NYC stop at Madison Square Garden where they shared the stage with Taylor Swift, Ed Sheeran, Camilla Cabello and more. The band has sold out back-to-back North American headlining tours, including their biggest trek to date earlier this year that was highlighted by multiple nights in NYC, LA, Chicago, and Toronto. High profile national television appearances include performances on NBC’s TODAY, ABC’s Good Morning America, nationally syndicated Live with Kelly and Ryan, and more. Press highlights include features in Rolling Stone, Entertainment Weekly, Billboard and TIME among others. Why Don’t We is Daniel Seavey, Zach Herron, Corbyn Besson, Jonah Marais and Jack Avery. For more information, please visit: WhyDontWemusic.com, Twitter, Instagram, Facebook, Youtube and Atlanticrecords.com.